In the United States, All Saints' Day (November 1) is not generally observed, but it is more important in Europe… for example, in Vienna, which is where this live broadcast originated on November 1, 1981. 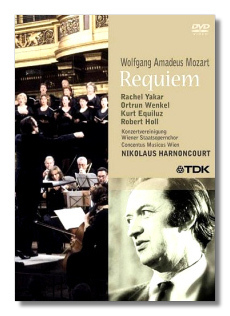 The same forces recorded a CD of the Mozart Requiem at about the same time (I assume), but here is this performance's first appearance on DVD. The "bonus" is Bach's 21-minute cantata, which actually came before the Requiem on the same concert program. There are arias for tenor and contralto, two choruses, and a final chorale. One notable feature of this performance is the use of wooden recorders, which make a fragile yet attractive sound. The absence of subtitles is regrettable not so much in the Mozart, but definitely so in the Bach, because the German text will be unfamiliar to most listeners.